Panzer Tracts; ISBN 0-9708407-9-9; 42 pages. This is the last word on its subject, as one would expect from the Panzer Tracts team. It covers the Kleine Panzerbefelswagen I in its observation role, the Sd.Kfz253 light halftrack, the Sd.Kfz. 254 wheel-and-track vehicle, the Sd.Kfz. 250/5 light halftrack, the Sd.Kfz. 250/12 for sound ranging and flash spotting, five version of the Sd.Kfz.251 medium halftrack, the 251/20 Uhu infra-red searchlight carrier, an 8-wheeled armoured survey vehicle, and the armoured fire control vehicle on 8-tonne halftrack chassis used for V2 rocket fire control. On the fully-tracked side we get the Pz III and Pz IV observation tanks and the one and only observation Panther. All these are documented in the usual Panzer Tracts style with information taken only from German wartime archive material, so the coverage is as authoritative as it could possibly be. The photographs are well-chosen and clearly reproduced, and in some cases very rare. Fancy a look inside the V2 control vehicle? It’s here! Hilary Doyle’s 1/35-scale plans show the Panzerbefelswagen I in four views, the Artillerie-Beobachtungswgaen IV in three and the Panzerbeobachtungswagen Panther in four, and there are a number of Doyle side-views as well including both sides of the V2 control vehicle. 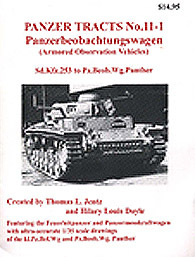 If you want to know about German observation vehicles this one is a “must buy”. Highly recommended.